I hope you all had a very nice Easter! Hopefully with lots of chocolate Easter eggs! Although that habit seems to be typical for Belgium and The Netherlands. Other countries apparently hide cooked eggs, painted in all sorts of colours. No matter what kind of eggs you’ve had, I hope you’ve enjoyed them! No chocolate or cooked eggs for this top 5 though! 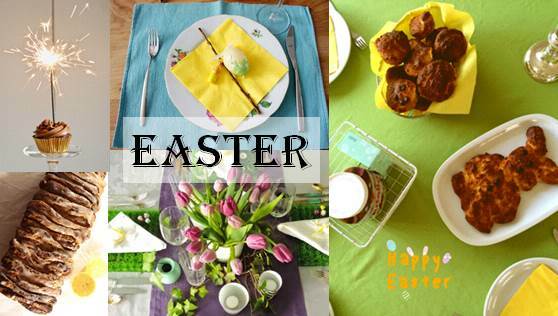 Alexia from Must Be Yummie made a whole Easter Brunch! I love her decorations! And I love her bunny too! Lieziepeasy decided to make something delicious as a count-down to Easter! Make sure not to miss her incredible Pull-apart bread with lemon. It looks so good! “Easter weekend has been a weekend of over-eating”. Well, Lisa, I would have over-eaten myself too if I had been exposed to your delicious table! The meat, the pie, the donuts, … Oh my! Last but not least: Ferrero Rocher Cupcakes ‘de luxe’ with Nutella frosting from our beloved Hap & Tap is so Easter! Why? Because she used Nutella’s Easter jar for this recipe! They look so so good! YUMM! Sarah is a 21-year Easter-loving foodie who loves nothing more than baking sweets for friends, family and anyone else who shares the love for all things sweet. She blogs at Sarah’s Kitchen and can be found on Facebook, Twitter, Instagram & Pinterest.